If you’re selling a horse, you know that buyers may request installment payment plans. Being open to this option can increase the number of potential buyers for your horse. But if you want the transaction to go smoothly, you must make sure that you’re informed and prepared. Remember that by selling a horse on installment payments, you’re extending credit and therefore taking on the role of a bank or credit card company. This comes with the risk of losses. Banks and credit card companies protect themselves with credit checks and financial disclosure requirements, but individuals don’t have these same tools at their disposal. Unfortunately, installment payment disputes in the horse industry are common. In order to avoid this, consider what could go wrong, and prepare for it. The risk of a buyer simply stopping payments is one reason why it’s important to retain your horse’s registration papers until the buyer makes the final payment. This is especially important if the registration papers determine the horse’s value for racing, showing or breeding purposes. While preventative measures like these could prevent buyer delinquency, there is always a risk in installment payment agreements that you will have to repossess the horse. However, if you attempt to repossess a horse by entering the buyer’s property, you can face legal battles and even criminal charges. To prevent this from happening, you need to properly document your right to repossess the horse. This requires a legally proper Uniform Commercial Code form and a carefully written lease agreement. In this contract, you must specify the circumstances by which you may repossess the horse from the buyer. To ensure that your lease agreement and related documents are legally valid and satisfactory to you, enlist the help of an equine law firm. Look for an attorney with experience and specialization in the field of equine law. In an unfortunate situation like this, you want to make sure that you don’t face a financial loss due to events that happened after the horse left your care. Again, this is where a solid and well-written sales contract can be your best friend. In your contract, you should specify that the buyer should bear all risk of loss once you’ve delivered the horse. This essentially transfers the risk from you as the seller to the buyer. There are a number of other lease agreement specifications that you might consider as well, depending on the circumstances of your transaction. For example, your contract could specify that the buyer must pay for the horse in full before you deliver the horse to them. This has a potential downside – that you will continue to pay for the horse’s upkeep – but this could also be addressed in the contract. Some lease agreements also specify initial down payments, a further protection against loss. 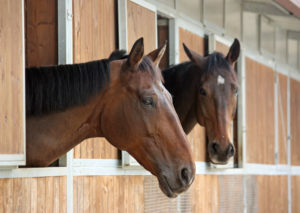 To build the equine lease agreement that’s right for you, work with our experienced equine lawyers.